Babysitting and baby care companies are plenty in most cities. They market their services in their own unique ways to drive customers’ attention. But a baby logo design that looks impressive is the key to reaching out to more potential clients. However, getting a baby care logo that speaks for your business is not easy. The importance of a logo for any business including your babysitting or baby care company is now well established. Marketing experts think that a logo helps build recognition for a business. This is mainly due to the fact that people gradually start making an emotional connection with the logo. That ultimately leads them to believe that your company is the right one to buy products or services from. Therefore, a well thought of baby logo design is of great significance for the growth of your company and business. Note that an aesthetically created design, such as a logo, can make a good first impression on viewers. Then, they are likely to think of buying your babysitting or baby care services. But how exactly will you get a remarkable and unique baby care logo? A logo represents a brand. Your brand deals in babysitting or baby care services or products. When designing a logo, consider that your business is about taking care of babies. That is also your business idea and mission. You should get the business symbol that can reflect your brand personality. When you have this point in mind, you will carefully choose typefaces, colors, and other elements. For example, most baby care or baby product companies use pink and soft colors in their logos. Remember that a brand is all about the perception it creates for itself amongst the target audience. So, the logo should be able to build the desired perception. Inspiration is the key to doing creative work. That is true also for designing logos. But what are its sources? First, brainstorm for new ideas. Sit together with your peers for discussion over how your business symbol should look. You may have many good ideas in this way. For inspiration, you can also scan your old collection of design works from masters. It stimulates the brain for new creative ideas. You can visit many online design galleries to have an inkling of how the design should look like. Since you will be competing hard to win clients, it is only prudent to know what your competitors are doing. Their marketing strategies matter a lot. You need to come out with a different plan. Similarly, when creating your baby logo design, first have a closer look at your business rivals’ logos. In fact, you need to ask questions when designing your logo. The aim here is to ensure a unique visual identity of your new childcare business. If the logo looks different, it sends a signal that your services or products are more useful. Also, when you know the competition, you can emphasize those differences when you design a logo. Looking For A Babycare Company Logo? Logos come in many design styles. They may be classic, retro or vintage, modern and minimalist, fun and quirky, and handmade or handcrafted. Which one of these styles will be most appropriate? That is a key question that you need to answer. Most baby product logos from baby care businesses are modern and minimalistic. Others are fun and quirky. But you can choose a classic style as well to look different and also to win the trust of your target customers. Which type of logo would you like to have for your babysitting and baby care company? There are, in fact, several types. If you pick a lettermark logo, you will put your company’s name, in short, using only its initials. These monogram logos are the choice for keeping the design simple and minimalistic. If you choose a wordmark type for a children logo, then you will use your full company name to give it a personality and recognition. A pictorial marks logo uses a symbol or image only. But many of them have a company name or slogan as well. Other types include abstract logos, mascots, emblem and combination mark. Know more about these types to choose a better one for your company. Colors evoke our emotions. Logo designers use this power of colors to send a brand message to the target audience. Since you are in a baby care business, prefer using soft colors such as orange, pink, and yellow. They build a calming environment and symbolize trustworthiness. Think of combining two colors to design a logo. Your baby logo is a key visual that must stand out. To make sure that it looks different, use typography that gives a different flavor and personality to the design. A professional graphic designer picks typography carefully to express brand personality. Use typefaces that speak out for the perception you would like people to have for your baby care products or services. Often, sans serif is the right typeface type to convey a message of care. These types of fonts create an informal and friendly environment. It would be even greater to pick a handwritten style of lettering. Handwritten letters are typically good for representing the tenderness and care associated with babycare related businesses. 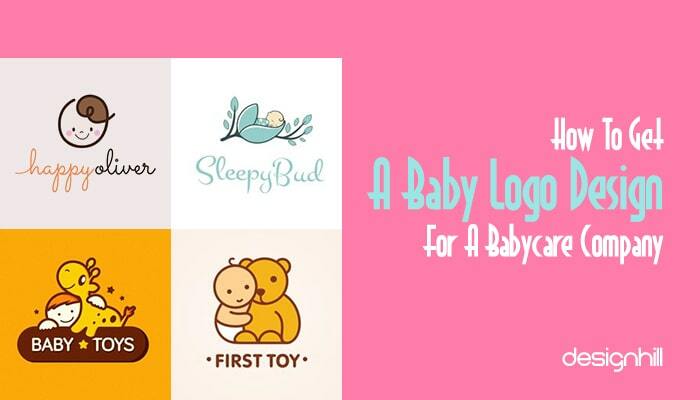 To get a unique baby logo design, make it certain that you guide the designers. Since you know more about your business than others and your designer, you should be dictating terms. The designer should come out with a logo that satisfies you. Therefore, write down a perfect design brief for your designer. The brief should contain the expectation from the logo. The brief should clearly spell out your business aspirations. You should also mention your choice of colors, typeface, any image or symbol. If you have some designs in your mind, give their links in the brief. Overall, the purpose is to let the designer know about your business, target audience, and your choice of design elements. Such a brief helps create a baby care logo that stands out. Once the designer has started working on your children logo project, be in constant touch with the professional. Whether you hire a professional graphic designer or you outsource the job to a design platform, enquire about the progress. Request the designer to submit you the ideas regarding the design. The designer will send you the work for your approval. If you want to suggest some improvement, tell outrightly about it. When the design process is going on, your suggestions will matter a lot to the designer. Another key thing worth mentioning to create a baby logo is avoiding cliched elements. A sign of bad logo or any other design is that it uses often-repeated symbols and images of an industry. For example, a logo of a dentist has a tooth in it, then it is surely a cliched element. Avoid such symbols and generic logos that have lost their novelty and value. This is where the importance of brainstorming comes to the fore. If some obvious ideas crop up, avoid them and emphasis on some novelty. Know that people stop responding emotionally to the things they have seen multiple times before. So, keep away from predictable ideas for your logo. To know about current graphic design trends is good for your professional career as a designer. But when creating a service or product logo, avoid trends. As a business owner, you would not like to redesign your logo more often every two years. This is because people build some attachment with a logo as it becomes part of their shopping experience. There are instances when redesigned logos created controversy amongst customers and experts. Therefore, do not strictly consider current design trends as they fade away soon. Once they are not in circulation, you feel the urgency to redesign your logo. That may result in a loss of clients. When you design baby logos, or as a business owner you give instruction to the designer, ascertain that the logo is simple and memorable. A simple logo avoids the use of multiple colors, typeface and complicated shape and complex line art. A characteristic of such designs is that people can get the message just at a glance. Remember that people can keep a simple logo in their memories for a long time. This is because they like such designs that look new and refreshing. Versatility is a vital characteristic of a memorable logo. When you create a logo, make it certain that it looks impressive across all online and offline platforms. So, it should appear as an impressive design on websites and various social media platforms. Not only that, it must also make an impact also on advertisements, web banner ads. Since most customers search and shop using smartphones, your baby logo design should also size up well on the small screens. Therefore, ascertain that it responds well to the requirements of tiny screens of various small mobile devices. Another great quality of a versatile logo is that it makes a good impression in its colorless version as well. Newspapers, fax documents, duplicate copies, etc have logos in black and white. Therefore, pick a design that looks great even without colors. To ensure that, pick a satisfactory pencil logo sketch and then fill the colors. That will give you a nice versatile logo in color and colorless versions. A logo is the face of any business and company. It is also a constant visual element present everywhere on all marketing campaigns and advertisements. This implies that the business symbol will be scaled very high and low for a variety of reasons. For example, if you put a billboard advertisement for your baby care products or services, the logo will be blown up to great heights. In that case, its various elements must look proportionate to each other. If it appears in a very small size of a postage stamp, it still should retain its vital details. No business would like to redesign its logo every second year. But it happens when people do not respond much to the design. For example, if your logo is trendy, it will become obsolete in just a few years when the trend fades away. Then, you have no option left other than to recreate your children logo. Instead, pick a design that is likable ever after many decades. Logos of most global companies are timeless as their designs address their customers. Then, these brands then tweak their logos here and there a little bit to make them look contemporary. These are the major points that you need to follow when creating a baby logo design. Invest your time and other resources to come out with an outstanding design that draws attention. You can outsource your logo work to Designhill, which is known for providing affordable but unique design solutions to business owners. Launch your design contest at this site to get many creative ideas and a winning logo for your babysitting or baby care company. If your babysitting or baby care company is small and looking to save money, then crowdsourcing of the logo is the best solution. You will get the logo at an affordable price and you do not have to hire graphic design services of an expensive professional. All you are required to do is to write a design brief and launch a logo contest at such sites. Many designers will start working on your logo project immediately. Designhill is one such marketplace where hundreds of clients come to have their design requirements fulfilled. Such sites are useful also to save your time and energy. The experienced designers will submit their works to you in response to the contest. You can then pick a winning design in a week or so. Babysitting and baby care companies want to stand out in their competitive markets. Therefore, a unique baby logo design can help them drive clients toward their new company. The logo should be simple, unique, and memorable. But you need to consider many other aspects to having such a logo that conveys your brand message.